One of the largest annual pilgrimages in Latin America has been marred this year by the death of at least 11 pilgrims. 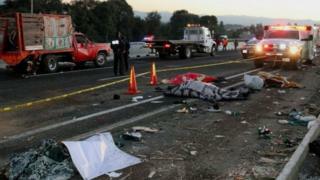 The truck they were travelling in crashed on a motorway between Mexico City and Puebla. The victims were among an estimated seven million pilgrims, who travelled to Mexico City to honour the Virgin of Guadalupe, the country's patron saint. A further 12 people were taken to hospital. The Virgin of Guadalupe is revered by Catholics around the globe. According to accounts published in both the indigenous language, Nahuatl, and Spanish in the 1600s, the Virgin Mary appeared to the indigenous peasant, Juan Diego, in the hills of Tepeyac in the outskirts of Mexico City on 9 December 1531. She spoke to him in Nahuatl and told him that a church should be built in her honour at the top of the hill where there had once been an Aztec Temple to the goddess Tonantzin. Two days later he returned to ask the apparition for proof of her existence. The Virgin told Juan Diego to gather Castilian roses at the top of the hill. The Virgin helped arrange the flowers in Juan Diego's tilmátli (a type of cloak), and he carried them back to Mexico City. When he arrived on 12 December and opened his tilmátli in front of the archbishop, the image of the Virgin of Guadalupe had been imprinted on it. The tilmátli is still on display at the Basilica de Guadalupe, one of the most visited Catholic shrines in the world. Being a woman of brown skin, the image of "La Guadalupana", as she is sometimes called, is one that unifies and reconciles Mexico's history and blends its Spanish colonial and Aztec heritage.